Three Earl Grey Teas and Cream. Lately, I have been drinking more tea. I tend to notice an affinity to drink coffee in the colder months, and teas in the hotter months. I have also been leaning towards more teas because of their wonderful health benefits. I have challenged myself to drink a cup of green tea, and black tea per day to increase my body’s immunity, fighting free radicals, and indulging in something that can stimulate me without the aftertaste of coffee. I love the variety teas offer and have been more creative in selecting unusual flavors and twists on classics. Earl Grey Tea #1-Art of Tea’s Earl Grey and Creme. 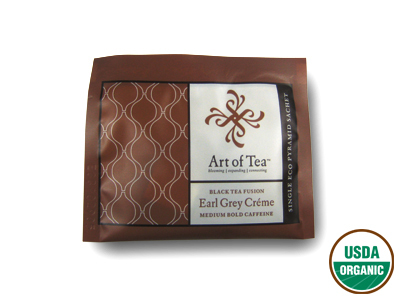 I was at a local shop with a friend of mine, and noticed a bag of Earl Grey Creme by “Art of Tea”. As a side note, I had previously purchased their Coconut Creme black tea and found it’s tropical, nutty aroma true to life, natural and the richness of the tea a pleasant experience. This caught my attention because I never imagined Earl Grey, it’s light, subtly floral flavor with the refreshing bergamot quality fused with rich and creamy French Vanilla. And its organic. Perfect for first time introduction to your tastebuds, this individually packaged tea may not be enough it's so good.. I wish I bought the entire tin! I sniffed the package, and inhaled a wonderful, strong aroma of bergamot and an underlying French Vanilla-custardy delicate note that encouraged me to buy it. I reflected briefly and remembered my mom making this tea- Earl Grey with a splash of mil and a Vanilla flavored creamer, and wondered why she was so hooked. One taste, and I understood completely. The first thing I noticed was the fragrance. Uplifting to the senses and emotions, I detected a strong current of bergamot, that married perfectly with the smooth vanilla flavor. Not only was this tea smooth and full in body, but the French Vanilla had toned down the citrus, but didn’t hide it too much. This was a delectable, dessert like treat that had depth. I added 2 teaspoons of white sugar, a little milk, and a Vanilla creamer (Coffee Mate’s French Vanilla). I was also able to make 2 additional cups after my first one, and although the flavor dissipated slightly, it was still strong enough to go around 2 more times. (One who for my friend) Impressive. I literally milked this tea to death-no cheesey pun intended. I paid $2 for this 1 bag, however, it was well worth it. As far as caffeine content is concerned, this tea has a medium amount, perfect to awaken the mind, but not too much. 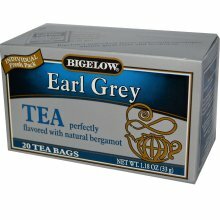 Earl Grey #2– Bigelow’s Earl Grey Tea. Bigelow’s tea to me is hit or miss. There are times I have had their tea and felt that the flavors weren’t strong enough. For instance, take their Vanilla Chai. Pretty packaging, however, too sweet. I have had other brands of Vanilla Chai and felt the Vanilla accented the Chai well, but still tasted the warm, earthy essences of the spiciness. The spices in chat make it chai! Now, I’m no Chai expert, however, I had the pleasure of tasting all types of chai, and even tasted Chai made from scratch by a native Indian on a regular basis in the past. I wasn’t expecting the same spice factor, but I wasn’t expecting to have a tea that was extremely sweet, either. I digress, though. So, upon making my Earl Grey with Vanilla creamer, milk and sugar, I noticed that the fragrance was lighter. Okay, not a big deal. I tasted it and compared to the first tea, noticed that the citrus undertones were a bit muted. The vanilla flavor was pleasant,(Coffee Mate’s Italian Sweet Cream Creamer) but the tea was overall not as strong and inviting as the other one. I realized three things at this very moment: 1) Art of tea makes incredible teas. 2) I shouldn’t compare the two, because this tea doesn’t have the creme finish and it’s a different brand/quality. 3) According to my tastebuds, Bigelow teas are average in my opinion. Some flavors just won’t suffice for me because they are not full/strong. Then I stopped comparing, and realized that the tea itself wasn’t bad. It just won’t be one I drink on a regular basis. Bigelow’s Earl Grey Tea Yumfactor– 3 tongues. (3 out of 5 stars) It’s not disgusting, but I was left searching for another brand. Specifically one with a stronger flavor of bergamot. Earl Grey #3- Stash Double Bergamot Earl Grey Tea. I was at Target (which I love!!) and saw a tea sale, and went crazy and bought 3 different teas: Mango Coconut Oolong, Double Spice Chai, and Double Bergamot Earl Grey Tea. I figured the Double Bergamot would suffice because Bigelow made me feel lie it didn’t have enough bergamot. Maybe the bergamot flavor in the Bigelow brand was a bit shy, and didn’t want to be noticed. I understand, bergamot, don’t worry *pats it on its shy back*. First and foremost, Stash teas are often lovely, full of flavor and priced at reasonable prices with a variety that is hard to ignore. I have often found myself pleased with the variety of teas, and the flavors they offer. Now, on to the tea. Good stuff, Stash, good stuff. I brewed a cup, and took note of the strong presence of the bergamot. Ah ha! I figured going off of the scent alone I would have a great replacement for the other brand (I was not able to make it to the store and get another box/bag/tin because of a few reasons so I needed a replacement). I added the milk and Italian Sweet Cream creamer and was pleasantly surprised with the similarity in body, richness and fragrance this tea had compared to the first one. I bought it for about $2.15 (for a box of 20 bags, which was *much*cheaper than the A.O.T, which was $12/6oz tin of loose leaf. There was also the individual bags, but, you get the picture.) When I added the Vanilla, it danced gracefully with the citrus overtones, and completed it effortlessly. 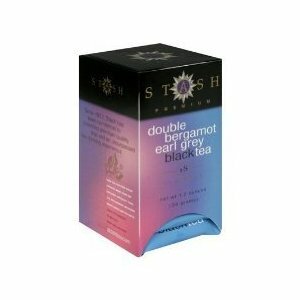 Stash’ Double Bergamot Earl Grey Tea Yumfactor– 4 tongues. (4 out of 5 stars) It’s inexpensive, rich, delicate and is satisfying. *Remember, all of these tea do contain caffeine, so be aware. If I had to rate according to faves, I’d say Art of Tea ranks in 1st place for innovative taste and over all quality, but is pricey, in my opinion. Stash follows closely behind, because of quality and value, although Art of tea’s Earl Grey has a stronger dessert like creamy presence. Then last, comes Bigelow, because, apparently, the bergamot in that tea has an inferiority complex and doesn’t like much attention. Please Rate/comment/subscribe! Thanks for reading! I love challenging myself and testing my willingness to step out of my comfort zone by assigning myself daring, fun and daily goals. I have a list of many items I have been wanting to cook, and will include them on here. So far, I’d say my progress has been pretty steady. I think cooking goals is a great way to break free of cooking the same dishes over again, and obviously a wonderful method to increase one’s cooking confidence! What cooking goals do you have for yourself? What are your general opinions on goals for success? Have you reached many of your cooking goals? What do you think of making a cooking goals list? (Restricting or innovative) If you has a list, what type of things would you include on it? This is NOT my comprehensive list. These are just some of the more interesting items I have decided to include. ENJOY! and feel free to add yours! Crab Cakes (jerked flavored?) from scratch with some kind of an interesting pineapple and jalapeno relish/salsa. Sweet Potato Wedges with a savory garlic and chipotle mayo. Asparagus cooked in a dry white wine, then topped with a garlic and herb hollandaise sauce OR topped with Italian seasoned panko break crumbs, still cooked in a garlic, butter white wine. Thai Chicken in both light and dark soy sauces, fish sauce, spices, and oyster sauces, with sweet Asian chili sauce. Add sweeteners to cheesecake, whip and dish it. Easy. Hello all! So, fun fact time: I love making and drinking smoothies. It’s a great way to get your fruits serving, calcium and even protein! It’s a great way to replace a meal, and you can even add veggies to your smoothies!!! (I think only carrots may work for this, though) I am currently drinking a green tea and strawberry (with orange juice) smoothie. I love the green tea’s light and herbal flavor, but I also appreciate its light caffeine content. I will be doing a post on why green tea is so epic of a tea, including health benefits, info on tea types (loose leaf, powder and bag). The only thing is I seldom measure when I create things, but I do want you guys to have the recipe. I do think these measurements are pretty accurate, though. It’s delicious! 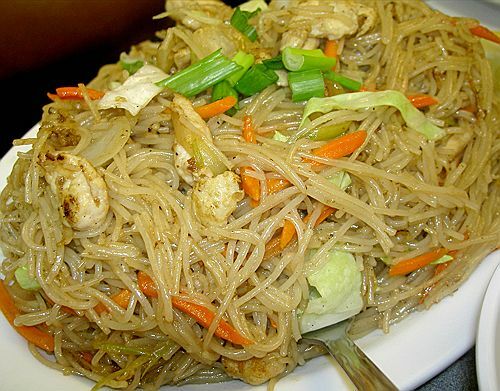 You’ve gotta try this recipe. 1 1/2 tsps.Matcha Powder (Green Tea Powder- I’m thinking you can also use 1/4 to 1/2 a cup of chilled green tea, just be sure to make sure you sweeten it prior to using it. You may need to adjust this as you go aing, because matcha powdered green tea has a different flavor than liquid green tea in drinks I find. So please, pour, mix and sip, then adjust if necessary! In order to make green tea, please follow the directions on the back of the green tea box.) I bought mine on ebay, but you can find it at Asian stores as well. 1/4 c orange juice (Really, I just poured enough in the container, and eye measured it. 1) Spoon 1/2 cup of Vanilla flavored yogurt into the container. This can be adjusted according to how much protein, yogurt content you desire. More yogurt will make the smoothie thicker in texture. 2) Add matcha green tea powder (or cold sweetened green tea) Then add 5 to 6 ice cubes. This can be altered to your personal taste level, but remember that more ice cubes equals a colder beverage, and too much ice can make the drink more slushy in texture. Smoothie will be more pink than green, because you are using a small amount of green tea. 4) Blend until smooth. You may have to premix the smoothie to ensure the yogurt becomes well incorporated. 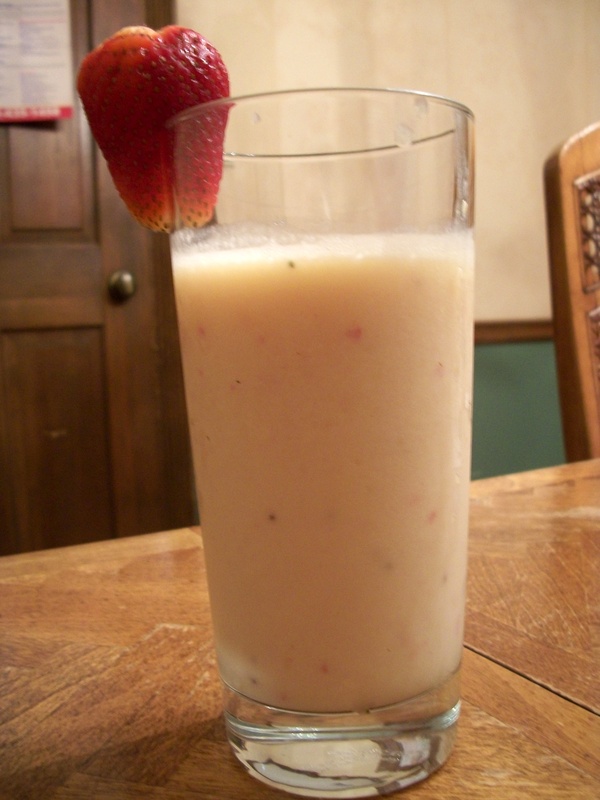 Smoothie is finishes when it is light pink in color, and smooth in consistency. If you see green powder, or yogurt, please blend until it mixes well. 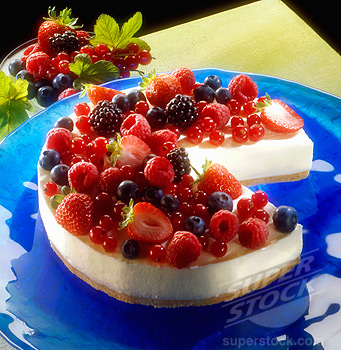 5) Garnish with a strawberry if necessary. Enjoy!! This can make 2 servings, but if you want more, you can add more milk, which shouldn’t alter the flavor of the smoothie. The consistency however, may be changed. 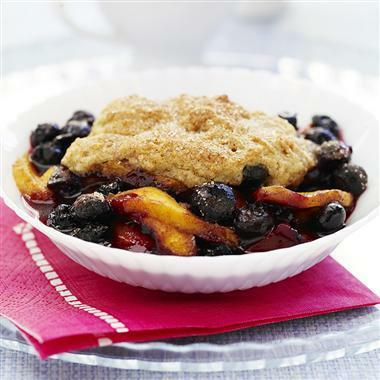 Play with the fruit content, as well as the yogurt content to get the balanced texture. The last blog (aside) that I wrote was nearly two weeks ago. Instead of blogging, I have been using some time to get some things done, but most of all, I have been cooking more!!!! I have made scones from scratch, biscuits, dinners, a peach cobbler with fresh sliced peaches, cakes, and interesting drinks! 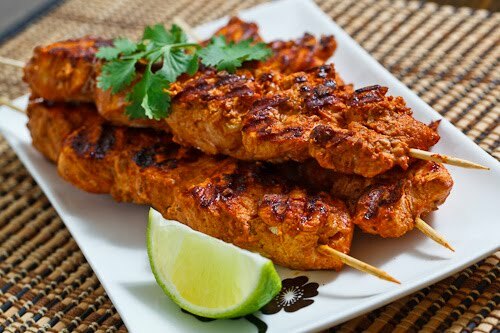 I have a few pictures of them prepared items and will try my best to share the recipes. (Some are from an app on my phone, so I’m not sure if you all will be able to access the same recipes I have used.) (Actually, the app is powered by allthecooks.com) Although I use recipes, I also get creative and add my own ingredients to it to give the dishes originality. So the way they come out will be a tad different from the ways your may if you do follow the directions very closely. Let me know if you are interested in anything else I have listed. I plan on doing a smoothie blog full of recipes and drink ideas I frequently use. Enjoy the 4 or 5 recipes!!! Fun smoothies (like Green tea, mango, orange juice and lime an original- Heavenly!!!) and classic ones, like mango strawberry yogurt smoothies. As of late, I have made three cakes from scratch (green tea and coconut with a glaze, and a pink grapefruit yogurt cake, which I covered previously, and layered carrot cake with a cream cheese icing), however I decided to make a box cake. 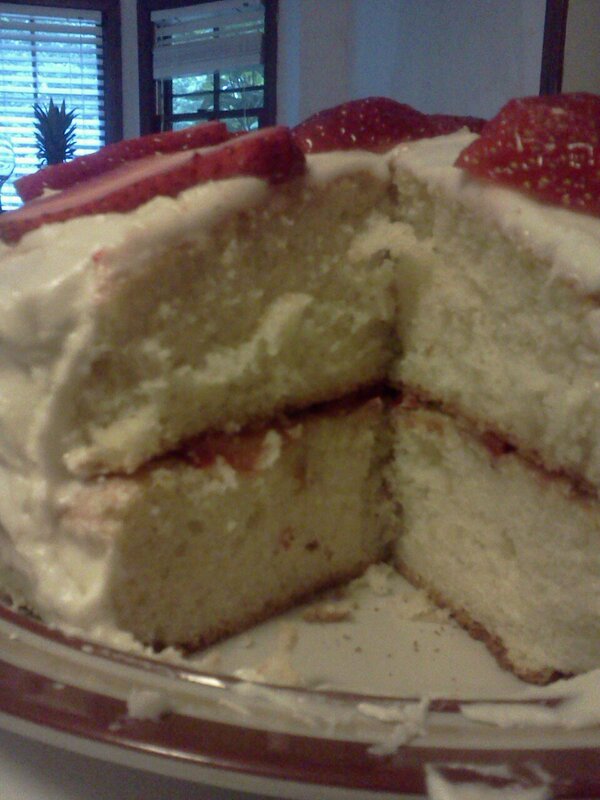 This is a French Vanilla Box cake, (with a homemade buttercream icing), but baked in as a layer cake, adding fresh strawberries (which I soaked in sugar and vanilla extract for 2 days). I then assembled the berried in between the layers, and frosted the cake, adding fresh sliced strawberries atop the cake for a pretty garnish. The cake was great, but the recipe I used for the buttercream icing was too sweet! I will NOT use that recipe again! There is no other recipe to link, so I will just post a pic, and say that you can make layered cakes from the box, and add whatever flavoring, fruits, or icing you want to make it more creative. So think of this as more if an idea, not a recipe. The lovely inside. See the itty, bitty berries? 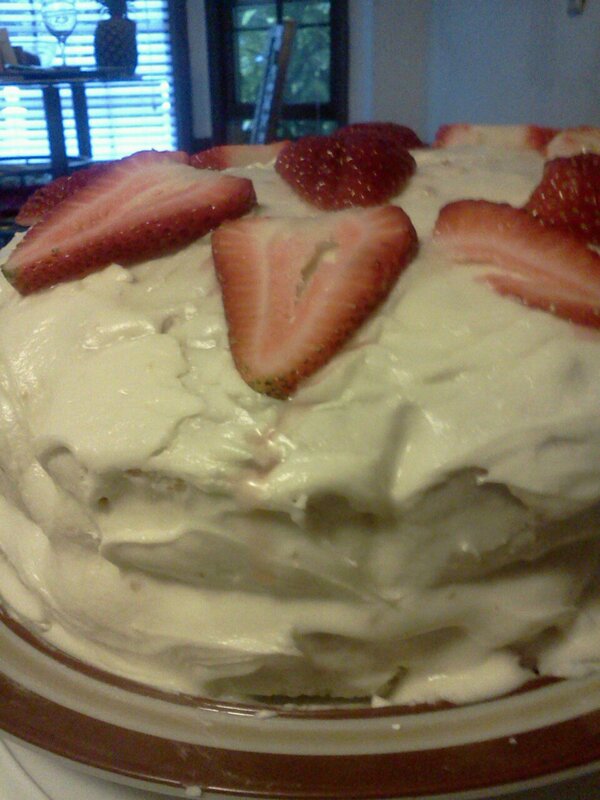 French vanilla layered cake with homemade buttercream icing and fresh strawberries. Tropical French Toast with bananas and coconut (with a hint of rum which I incorporated in the french toast egg/milk wash) This recipe calls for flour to be used, which makes the french toast more decadent. I also added approx.1 teaspoon of vanilla pudding mix to made the toast more creamy (which I got from another recipe) I did not have any thick bread on hand, so I used plain old wheat. http://allrecipes.com/Recipe/fluffy-french-toast/Detail.aspx For the fruit, I simply took some banana pieces, added butter, sugar, cinnamon, nutmeg, and cook it until it got soft to my preferred desire. I then took some shredded coconuts, and sprinkled it over the banana. 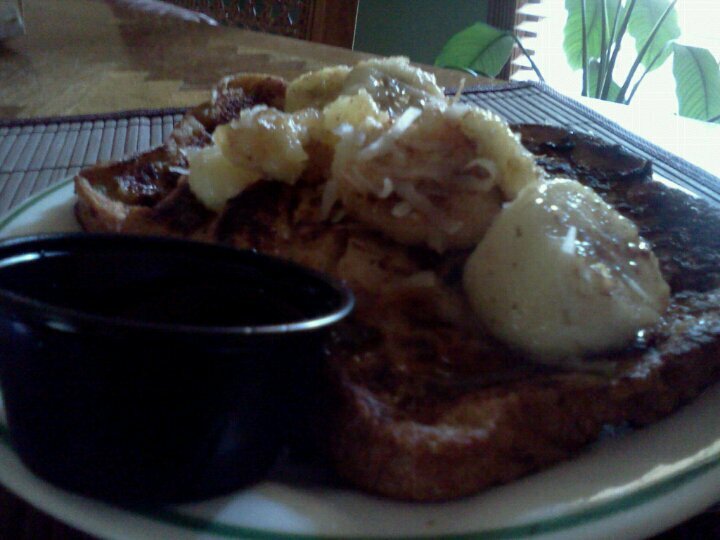 Tropical French Toast with slightly caramelized bananas. They weren't super ripe, and I probably didn't use enough brown sugar. Still good,though. Peach Cobbler with fresh peaches, and a “special ingredient” not listed. I again made it my own by using 3/4 cup of vanilla soy milk, less than 1/4 cup of half and half (to make it a tad fluffy), water (I do that sometimes) and 1 service which is a teaspoon of french vanilla creamer. I added an ingredient that gave the sweet peaches depth, and also some apple pie spice to round the spicy and sweet flavors out. 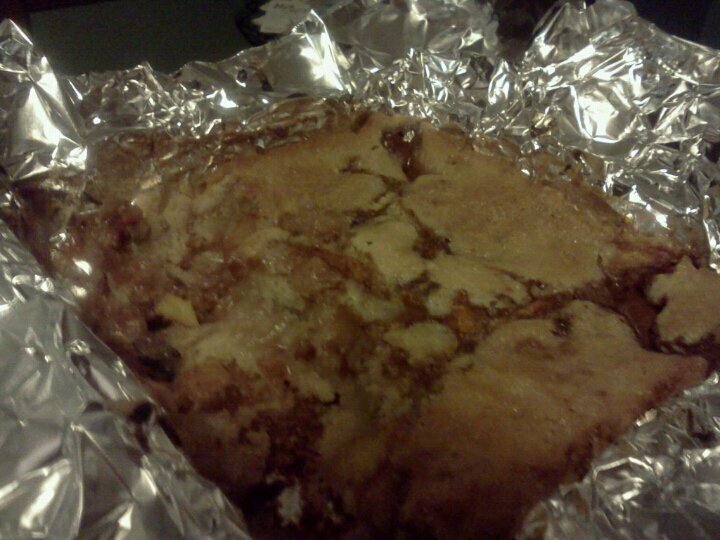 The crust was a bit more dense that other cobblers I have had, and slightly cakey, but I actually liked its richness. 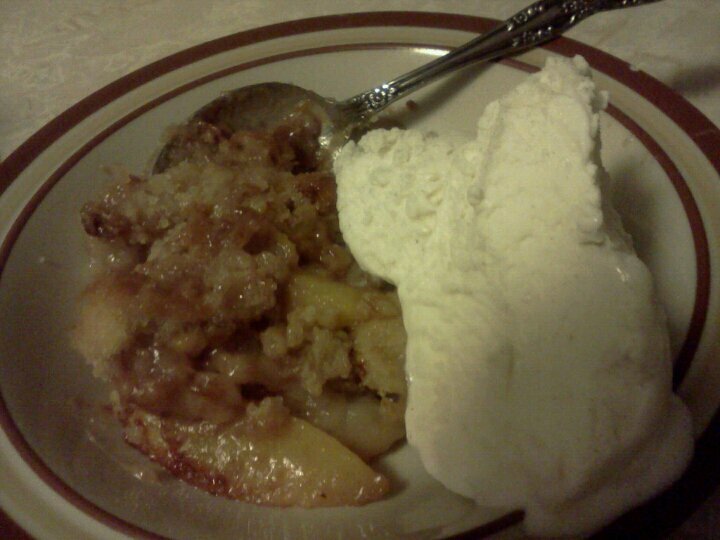 Cobbler before I tore into it like an animal. 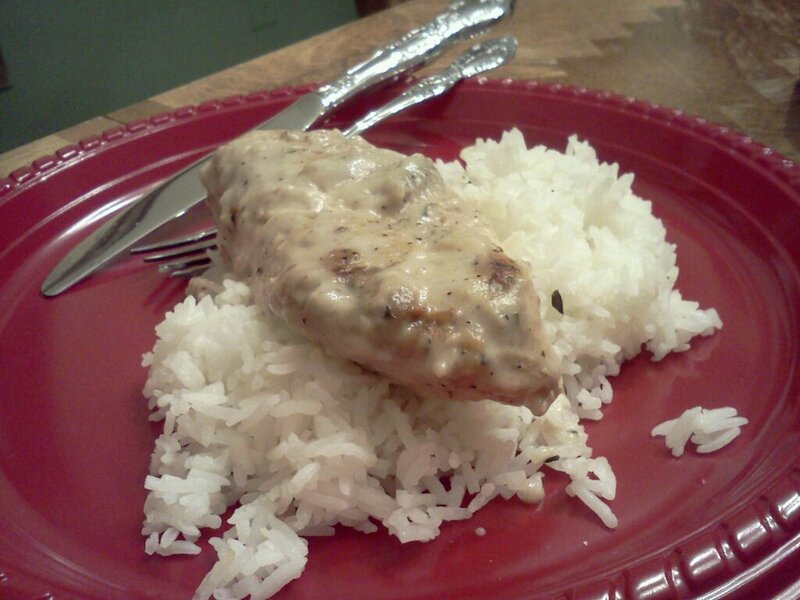 Buttermilk chicken with cream of mushroom and thyme sprinkled rice. 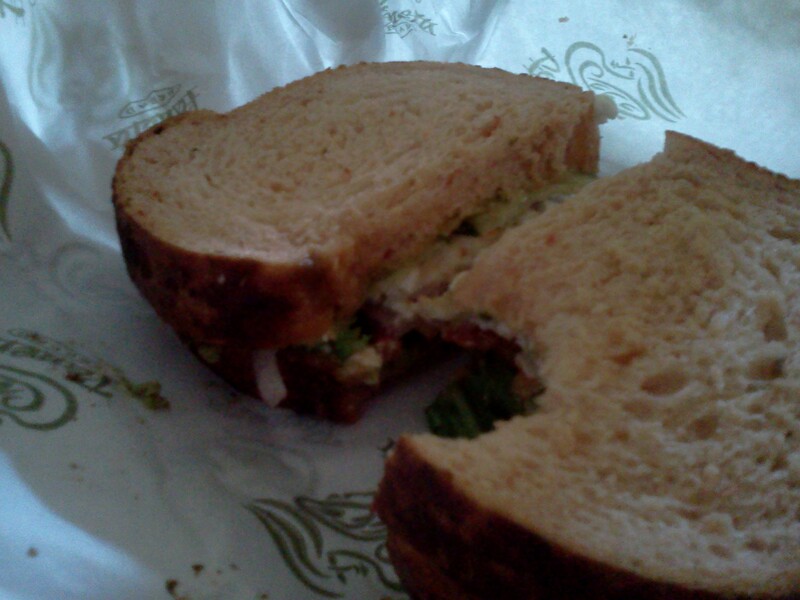 Everyone who knows me knows how much I love and often crave Panera’s Mediterranean Veggie Sandwich. Here’s why. It’s light and refreshing, healthy, full of both sweet and savory flavors, and it’s rather exotic in nature. First, let’s analyze this sandwich from inside out. Sun dried tomato and basil bread, with a sweet undertone around the crusts, a tangy hummus spread on the bread adding a nice kick of flavor and complexity,cilantro, fresh cucumbers, lettuce, spicy Peppadew peppers, red onions, and tomatoes…and FETA cheese!!!! The bread is soft and full of flavor itself. 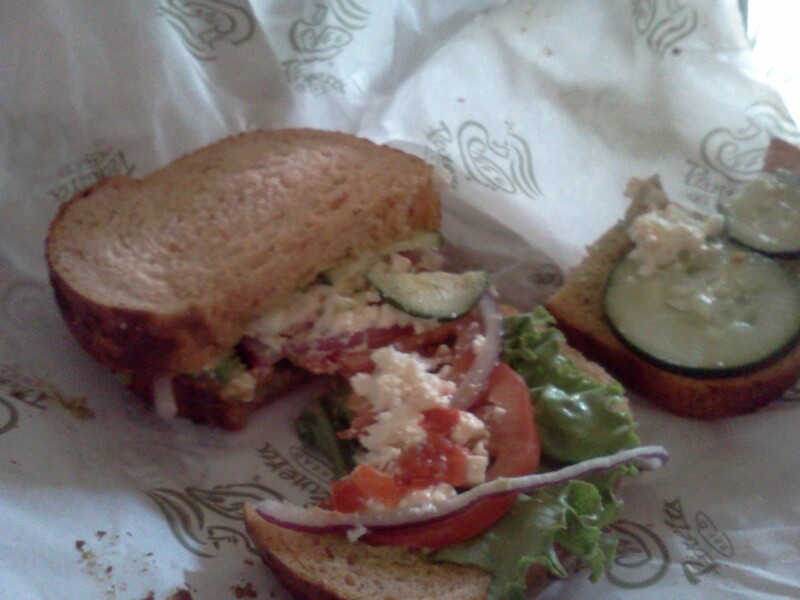 Panera’s Mediterranean Veggie Sandwich Yumfactor- 5 tongues!!! I just only wish there were sun-dried tomatoes versus regular ones, but it’s still amazing! Cost- $6.30 including tax. Mocha Coconut, Double Chocolate Chip and Strawberry Creme Frappuccinos. 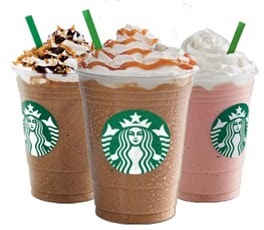 From May 6 to the 15 between the hours of 3 to 5 pm, Starbucks is offering their “Happy Hour” special which includes getting your favorite fraps at half price!! me and a friend bought 2 frappuccinos at $1.87 each!!! that is incredible! Choose From The following flavored syrups: Caramel, Mocha, Coconut, Vanilla Bean, Strawberry, White Chocolate Mocha, Raspberry, Hazelnut, Cinnamon Dolce, Green Tea, Peppermint, Toffee Nut (also yummy), Double Chocolate Chip, and Coffee. Add soy milk, low fat, or regular milk, and add extra portions of coffee, topping it off with whipped cream, or flavored drizzles! 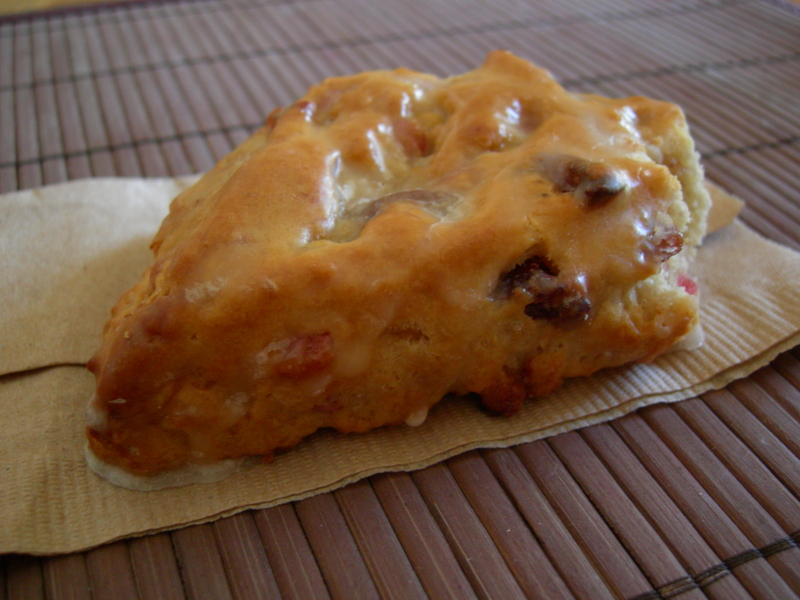 Panera Bread's Strawberry and Cream Scone. 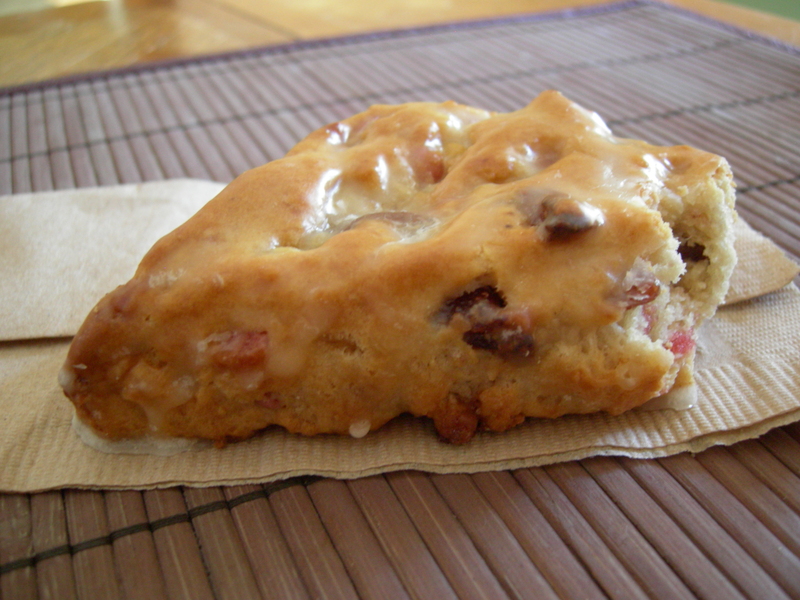 scone. Hmm.. Instantly, I wondered it the scone would be glazed, or have a biscuit colored, creamy texture with bits of the dehydrated strawberries, and occasional tastes of vanilly nuggets. I even wondered if there would be any detection of cream at all, just to make sure Panera was not tricking me into thinking cream was in the scone. Having already tried and loved the orange scone, I knew this one had to be consumed and fast. 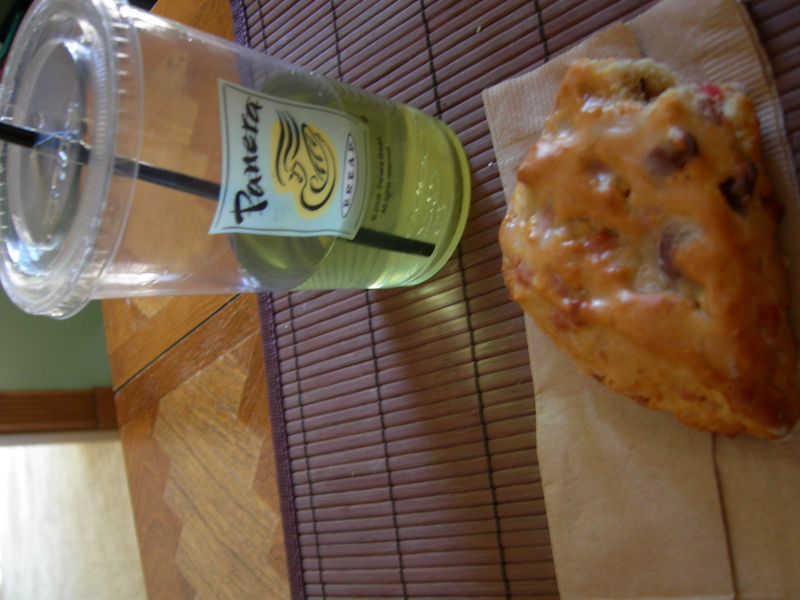 So I bought one with a no ice, iced green tea. That’s how I do it, so I can get every drop of my drink without th ice deception making it look like I have more than I actually do. Milking it is my middle name. So what? I’m a broke college student. 😉 The texture was about the texture of their orange scone- rather hard but soft. Imagine eating a donut stick by Little Debbie this is exactly the consistency it has, and the glaze was a clear, sugary glaze that the donut stick has. I was slightly disappointed, because I was expecting thicker, opaque glaze similar to their orange scone glaze, but obviously in a vanillish cream variety. The taste was both refreshing as the strawberries gave a tanginess to contrast the sweet glaze, almost buttery more so than creamy, however. 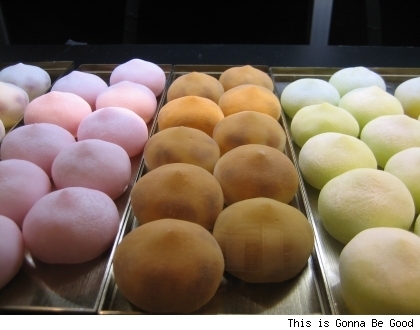 I;d have to pass on this one, though it isn’t bad, it does nothing in competition with the beautiful orange scone. 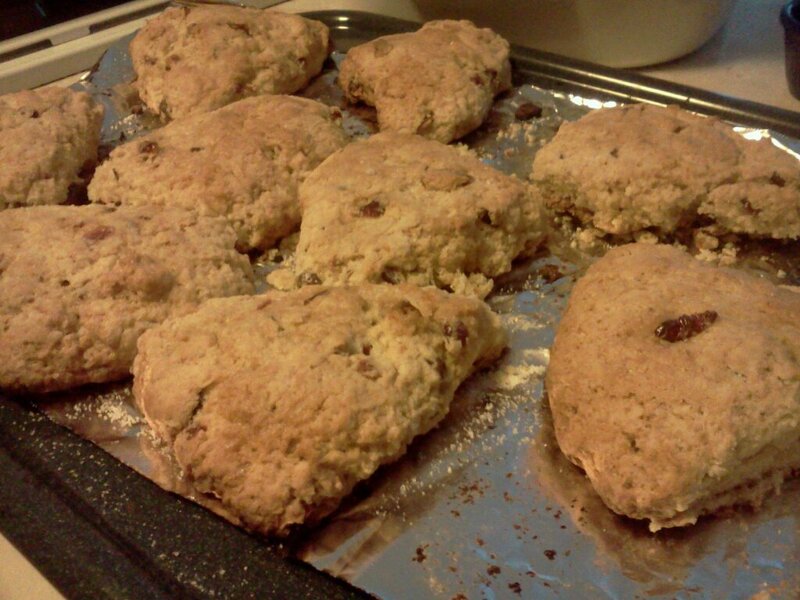 Pros: I love the fact that the scone had real dried strawberries versus those little dried hard balls of fruit you get in jiffy muffin mixes. Bring on the realness! Cons: The glaze is like a dried glaze you’d eat when eating a little Debbie caked donut. Twins??? Or rather, it’s three-sided cousin from up North. Either way, they can very well be in the same family. May not be a bad thing if you don’t care. 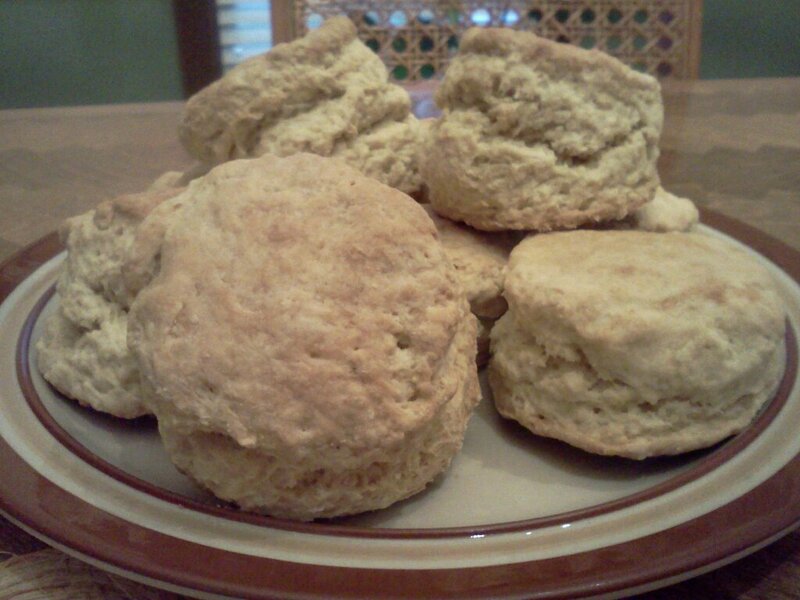 Also, strong buttery taste and a harder than normal scone texture. Perhaps, it’s the hardened glaze? Yumfactor: About 3 tongues and a taste bud.